A copious number of regional and international companies are trying to surge ahead of one another in the global refrigerated display cases (RDC) glasses market leveraging multi-pronged strategies. Carefully-considered acquisitions and mergers to expand geographical footprints, addition of new services, and offering cost competitive and technologically advanced products are some such popular strategies. This makes the market highly competitive and fragmented in nature. The swiftly expanding frozen foods market and the increasing food supply chain is primarily serving to increase growth in the global refrigerated display cases (RDC) market. Apart from that, technological progress, leading to emergence of low-emission and anti-reflective coatings have also led to the sales of RDC glasses. As per a TMR report, the volume in the global refrigerated display case (RDC) glasses market will likely rise at a CAGR of 5.7% from 2017 to 2025 to become worth 187,525 million square meter by 2025. The global refrigerated display cases (RDC) glasses market can be segmented based on different parameters. Depending upon the type of design, for example, the market can be split into single glazed glass and double glazed glass. While the single glazed glass is made from a single pane of glass, the double glazed glasses are made from two separate pieces of glass, separated by a vacuum, which acts as an insulative barrier. Because of the vacuum space in-between, the double glazed glasses are 80% to 100 % more efficient than single glazed glasses. This also accounts for their greater uptake and larger share in the market. The double glazed glasses are projected to maintain their leading share in the years ahead as well on the back of solid demand from different industries. 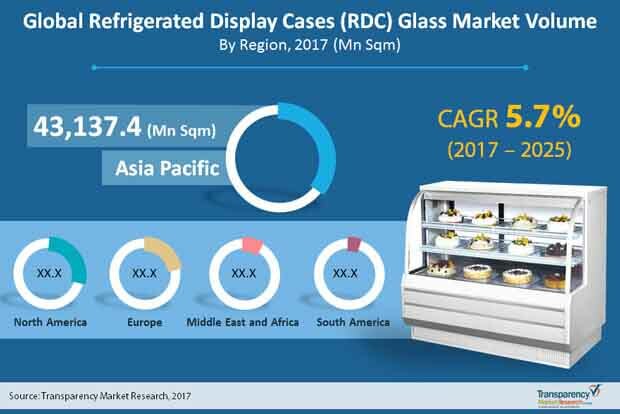 From a geographical standpoint, the global refrigerated display cases (RDC) glasses market is dominated by Asia Pacific. Both in terms of volume and growth pace, the market in the region is ahead of others. This is because of a burgeoning retail and food processing industry which are primarily responsible for the sale of refrigerated display casess (RDC). Such commercial consumers are increasingly preferring energy efficient technological equipment to save on operating costs. In the years ahead too, the market in Asia-Pacific is expected to make impressive progress by clocking a CAGR of 6.2% from 2017 and 2025 to become worth 69.55 billion square meter by 2025. This is mainly on account of the proliferation of cold chain, food retail industry, strict regulations pertaining to food safety, and technologically superior products. China and India are main drivers of growth in Asia Pacific. In terms of volume, North America trails Asia Pacific. Although it is expected to expand at a relatively slower pace of 5.6% in the forecast period, it will likely retain its second position by growing the volume to 53.08 billion square meter by 2025. Europe too is predicted to witness a slower growth compared to Asia Pacific. Between 2017 and 2025, the market in the region will grow at 5.4% to become 40.93 billion square meter. Some of the prominent participants operating in the global refrigerated display cases (RDC) glasses market are Beverage-Air Corporation, AHT Cooling Systems GmbH, Hussman International, ISA Italy S.r.l., Kysor/Warren (Lennox International), Metalfrio Solutions S.A., SRC Refrigeration, and REMIS GmbH. Some of the glass makers, coating providers, glass processing, door assembly, retrofitting companies in the market include Anthony (a Dover Company), Guardian Glass, Schott AG, GroGlass, Glacier Door Systems, Styleline Doors, Falkberg, and Thermoseal Industries. The global refrigerated display cases (RDC) glasses market report provides analysis for the period 2015–2025, wherein the period from 2017 to 2025 is the forecast period and 2016 is the base year. The report covers all the major trends and technologies playing a key role in refrigerated display cases (RDC) glasses market growth over the forecast period. It also highlights the drivers, restraints, and opportunities expected to influence market’s growth during the forecast period. The study provides a holistic perspective on the refrigerated display cases (RDC) glasses market’s growth throughout the above mentioned forecast period in terms of volume (in Mn Sqm), across different geographies, including North America, Europe, Asia-Pacific, Middle East & Africa (MEA) and South America. The market overview section of the report demonstrates the market dynamics and trends, such as the drivers, restraints, and opportunities that influence the current nature and future status of this market. An attractiveness analysis has also been provided for every geographic region in the report, in order to give a thorough analysis of the overall competitive scenario of the refrigerated display cases (RDC) glasses market, globally. Moreover, the report provides an overview of the various strategies of key players present in the market. Introduction and market definition chapter helps in understanding different technologies of refrigerated display cases (RDC) glasses along with their applications which are included in the report. The report segments the global refrigerated display cases (RDC) glasses market on the basis of design type into single glass and double glazed glass. Thus, the report provides in-depth cross-segment analysis of the refrigerated display cases (RDC) glasses market and classifies it into various levels, thereby providing valuable insights at the macro as well as micro levels. Further, the refrigerated display cases (RDC) glasses software market. On the basis of country, North American market is divided into The U.S., Canada and Rest of North America. Similarly, Europe market is divided into The U.K., Germany, France, and Rest of Europe. Asia Pacific has been segmented into China, Japan, India, Australia and Rest of Asia Pacific. Middle East and Africa covers the GCC countries, South Africa and Rest of Middle East and Africa. Similarly, South American region includes Brazil, Argentina and Rest of South America. This report provides all the essential information required to understand the refrigerated display cases (RDC) glasses and its components. Furthermore, Porter’s Five Forces analysis explains the factors which are currently affecting the market. This report also provides the value chain analysis for the refrigerated display cases (RDC) glasses market which explains the participants of the value chain. The report also provides the current and forecast adoption trend of various coatings used in glass, such as Low-emission coating, anti-reflective coating and combination of both ones. The report also highlights the competitive landscape of the refrigerated display cases (RDC) glasses market, thereby positioning all the major players according to their geographic presence and recent key developments. The comprehensive refrigerated display cases (RDC) glasses market estimates are the result of our in-depth secondary research, primary interviews, and in-house expert panel reviews. These market estimates have been analyzed by taking into account the impact of different political, social, economic, technological, and legal factors along with the current market dynamics affecting the refrigerated display cases (RDC) glasses market’s growth. Some of the key players engaged in refrigerated display cases (RDC) glasses market include various manufacturers such as AHT Cooling Systems GmbH, Beverage-Air Corporation, Hussman International, ISA Italy S.r.l., Kysor/Warren (Lennox International), Metalfrio Solutions S.A., SRC Refrigeration, PAN-DUR GmbH and REMIS GmbH. Some of the glass makers, coating providers, glass processing companies and Door Assembly, Retrofitting companies are Anthony (A Dover Company), Guardian Glass, Schott AG, GroGlass, Glacier Door Systems, Styleline Doors, Falkberg and Thermoseal Industries. Details such as financials, and products/service offerings pertaining to these players have been duly provided as part of company profiling.